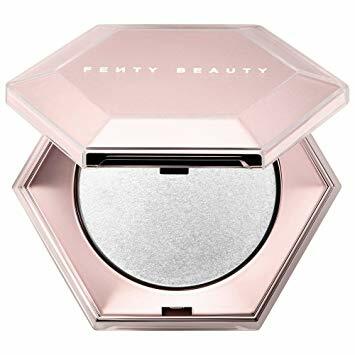 A one-of-a-kind diamond-dusted highlighter that applies like a 3D glittering veil, delivering pure, show-stopping sparkle all over the face and body. Ice yourself in insane diamond-dusted sparkle. Diamond Bomb takes glitter to a whole new extreme in a shimmering 3D formula that’ll leave your face and body crystal-coated, the way only Rihanna knows how. Celebrate one glittering year of Fenty Beauty with this all-over sparkler that will make you look and feel like a million bucks. Diamond Bomb features a unique jelly-powder formula that’s bouncy, cool to the touch, and melts into skin like butter. This highlighter is loaded with 100% pure brilliance to create an all-glitz-no-grit finish that decks out every skin tone. Plus, all of this glittery goodness comes in a faceted jewel-like compact you’ll never want to put down. Melanie Mills Hollywood Moisturizing Gleam Body Radiance - Deep Gold, 1 fl.oz.